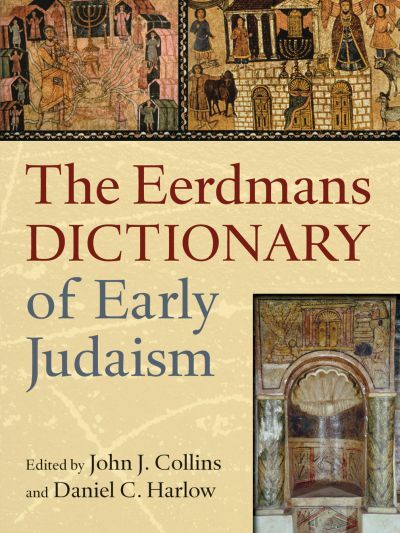 This volume is reprint of 13 major essays originally appearing in the first part of the Eerdmans Dictionary of Early Judaism ( Grand Rapids, Mich.: Eerdmans, 2010). This Dictionary was a major contribution to the study of Second Temple Period Judaism when it was released two years ago, but with a list price of $95, most readers were unable to afford the book. The editors comment in their introduction that this reprinting allowed for corrections and emendations as well as some expanded bibliography. A five-page chronology of the period is included (538 B.C.E. – 200 C.E. ), as well as 13 maps. There are 71 black and white photographs in the center of the book. I am not sure if all of these maps and photographs appeared in the original Dictionary, but the few I checked did. The description “early Judaism” is used to describe the period of development during the Hellenistic and early Roman period. The term “Second Temple Period” was too broad. Since that period is usually defined as 520 B.C.E. to 70 C.E., it would include most of the writings of the Hebrew Bible. For this book, “early Judaism’ refers to the period from Alexander the Great through the Bar Kokhba revolt (135 C.E.). The essays in the book are not broken into sections, although there is a general pattern to the book. After an introductory essay on “Early Judaism and Modern Scholarship” by John Collins, three essays appear charting the history of the period. Chris Seeman and Adam Marshak describe the long period from Alexander the Great to Hadrian, the historical boundaries of Early Judaism. This is a very brief overview (forty pages for 400 years?) The next two essays describe “Judaism in the Land of Israel” (James VanderKam) and “Judaism in the Diaspora” (Erich S. Gruen). Both essays briefly comment on the literature produced in the Land and in the Diaspora, although these are covered elsewhere in the book. The two chapters are excellent when read together. VanderKam describes the critical importance of the Temple to those dwelling in the Land while Gruen describes the importance of synagogue to those in the Diaspora. Gruen has several sections of interest for students of the New Testament, including Gentile attraction to Judaism and the “boundary markers” used to maintain Jewish identity. Seven of the essays deal with the literature of the period. This ought to be expected since there is a great variety of literature produced during this long period. Eugene Urlich describes the move from texts to Scripture to Canon in his “The Jewish Scriptures: Texts, Versions, Canons.” James Kugel (“Early Jewish Biblical Interpretation”) comments on the interpretation of Law within the Hebrew Bible itself as well as the trajectories found in extra-canonical texts like Jubilees. Loren Stuckenbruck contributes an article on the “Apocrypha and Pseudepigrapha.” This article was somewhat frustrating in this format of the book because it is not able to treat any given book in these broad and imprecise categories with anything more than a line. If I was reading the article in the Dictionary, I could easily turn to the articles on Tobit or Enoch for a more in-depth introduction. Eibert Tigchelaar has a nice introduction to the Dead Sea Scrolls which steers clear of archaeological controversies and focuses on the texts. Katell Berthelot’s essay on “Early Jewish Literature Written in Greek” treats some literature which might be categorized as Apocrypha, others that are Pseudepigrapha. Her summary of themes in this literature is excellent, concluding that “this literature documents a remarkable attempt to embrace Greek culture while maintaining a distinctive Jewish identity” (249). Two essays were added to this collection with appeared as entries in the original Dictionary. The chapter of Philo compiles the Dictionary articles on Philo (Gregory Sterling), Allegorical Commentary (Maren Niehoff), Apologetic Treatises (Gregory Sterling), Exposition of the Law (Maren Niehoff), Philosophical Works (Annewies van den Hoek), and Questions and Answers on Genesis and Exodus (David T. Runia). The order of these sections is different than the original Dictionary and Sterling’s concluding paragraph is placed at the end of the chapter. That each section is not identified by author is a minor frustration. While this is mentioned in the introduction, it would not have been very difficult to include a “signature” at the end of each section. The chapter on Josephus compiles the Dictionary entries on Josephus and Antiquities (Steve Mason) Against Apion (John Barclay) and Jewish War (James McLaren). As with the chapter on Philo, these sections are edited without indicating which author wrote the section. Steve Mason’s article on Josephus is interrupted after his discussion of Vita, the sections on Apion, Antiquities and Jewish War are inserted at this point. Mason’s original article picks up again, treating the reception and interpretation of Josephus. While not precisely a form of literature, Jürgen Zangenberg’s article on “Archaeology, Papyri and Inscriptions” provides an overview of this massive collection of data that is often ignored by scholars studying the period. Since there are so many books from this period, it is easy to overlook this sub-form of literature. Zangenberg’s article is handicapped by trying to cover too much, each of his sub-sections could have been a full chapter. The final three chapters of the book cover Jews and “others.” Miriam Pucci Ben Zeev describes the usually tempestuous relationship of the “Jews among the Greeks and Romans.” Her article describes controversies in Rome, Asia Minor, Syria and other regions. Daniel Harlow contributes a stimulating article on “Early Judaism and Christianity.” It is almost impossible for someone to write on this topic without interacting with E. P. Sanders and the developments in scholarship since his Paul and Palestinian Judaism. After surveying Jesus, the earliest Jesus followers and Paul, Harlow comments that the essential pattern of “covenantal nomism” looks very much like Paul’s view. Harlow sees Paul’s view of the Law as very complex, even “convoluted” compared to the other writers in the New Testament. Finally, Lawrence Schiffman treats “Early Judaism and Rabbinic Judaism.” This chapter is very brief (a mere 14 pages) and attempts to show that the sectarianism of “Early Judaism” was at odds with the Pharisaic-rabbinic Judaism which develops after 200 C.E. Part of the problem is inadequate documentation of the development from the pre-70 C.E. documents to the rabbinic texts which begin to develop after 200 C.E. The unwritten tradition of the Pharisees is the “real basis of rabbinic Judaism” (434). Early Judaism: A Comprehensive Guide is an affordable, handy collection of essays which would make an excellent college or seminary textbook. It is not overly technical, providing the scholar with necessary details without sacrificing readability. While I was occasionally frustrated by the brevity of the essays, this does not distract from their usefulness as an introduction to broad topics. Each essay concludes with a short bibliography to encourage the reader to pursue these topics further. NB: Thanks to Eerdmans for a copy of this book to review. ← Acts 15 – Why was Circumcision So Important?